Deep in Deb's Park you'll find the true way to use a trailer. 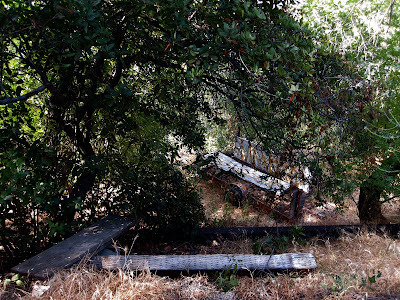 Out amongst the shady trees is a wooden platform about 10 feet below two rows of seats nicely carved out of the slope. Yes, there is some bench seating but that will cost you more. How great would it be to see a band play there one afternoon?! Just don't bring the big stand up bass. Geto Boys "My Mind is Playin' Tricks On Me"
This was about 2003, or maybe 2002...but he had a trailer, like the kind you live in. That road is pretty steep, and he had to go through the park to get it there. It has been a while since I have been down there, but I think you can see some cinder blocks where the thing was set down. Was a pretty nice set up but illegal...we called him the "Squatter".